TOPIC: God & Science: Do they work together? Former Davidson College chemistry professor James G. Martin, Class of ’57, earned his Ph.D. in chemistry from Princeton University, ’60. During his twelve years on Davidson’s faculty, he played tuba in the Charlotte Symphony and officiated high school football. He wandered into precinct work as a Republican, and was elected to the Mecklenburg Board of County Commissioners in 1966---serving three two-year terms, twice as chairman. In 1972, he was elected to the first of six terms in the U.S. House of Representatives, rising to a ranking position in the Committee on Ways and Means. 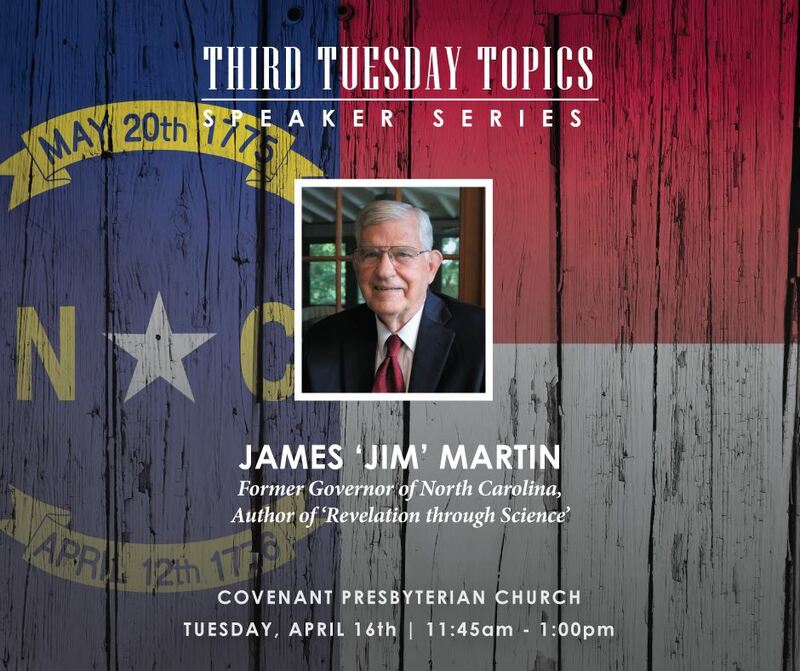 In 1994, Jim was elected Governor of North Carolina, serving two terms, dedicated to “Better Schools, Better Roads and Better Jobs.” After return to private life as research director and then federal lobbyist for Carolinas Medical Center, Dr. Martin retired and wrote his first book, Revelation Through Science.